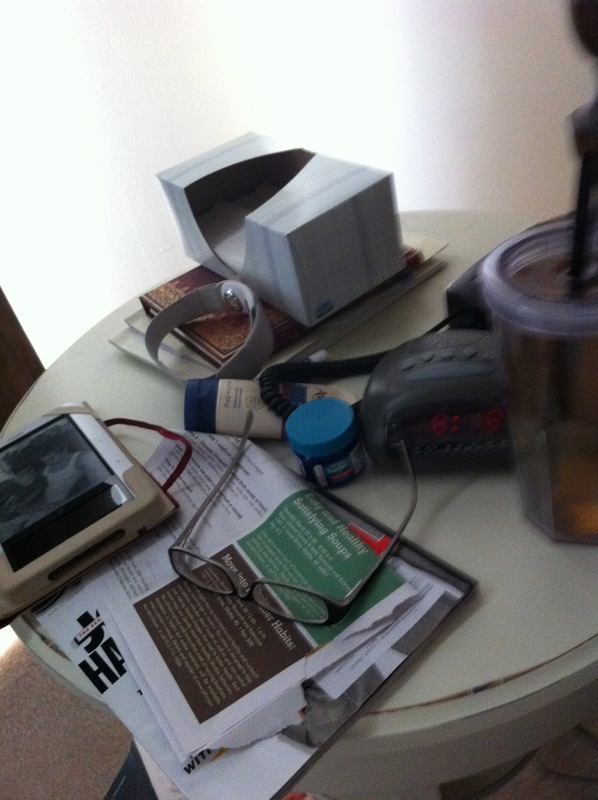 My bedside table. It’s a mess, I admit, and I cleaned it up soon after I took this picture. But it has the essentials: my nook, some magazines, Chapstick (must always have Chapstick), Emergency Nursing Journals that I never read, a pretty journal I haven’t written in yet, my alarm clock and phone, a good lamp for reading, kleenex and vicks vaporub because I had a cold last week, a recipe I want to try, and the armband I use to track my physical activity. You’d think I spent all my time in bed, but I only get to read in bed once a week or so. I just wish I could every day.